Liver cancer. 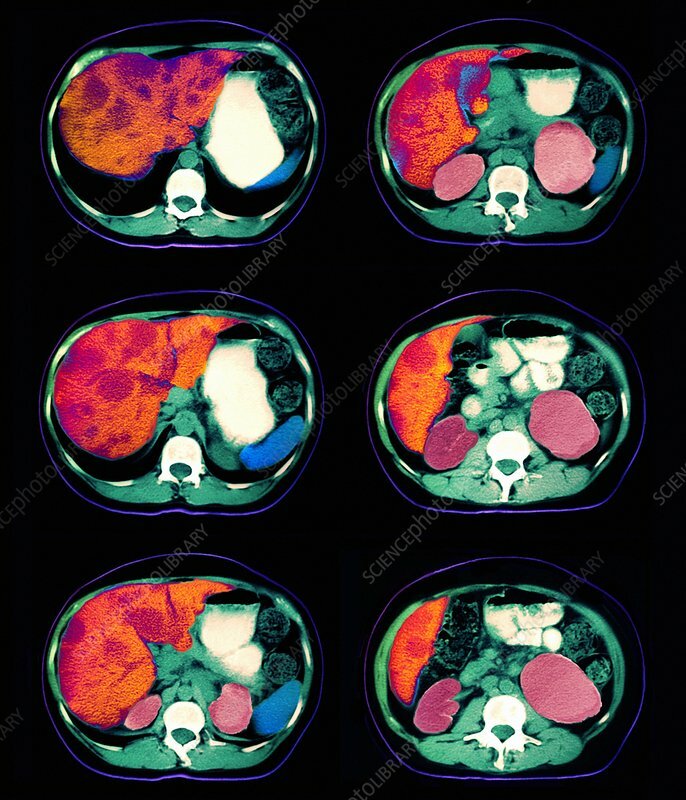 Coloured computed tomography (CT) scans of sections through the body of a female patient with secondary liver cancer. The dark blobs in the red/orange liver are tumours. These tumours spread from a primary cancer site in the patient's uterus. The spread of cancer from one site to another is known as metastasis. Secondary liver cancer is fatal and incurable, although anticancer drugs may slow its progress. It can cause weight loss, lethargy and abdominal pain. Also seen here is hydronephrosis of one of the kidneys (pink, right side of right three scans). This is due to the blockage of the urinary tract causing the kidney to swell with urine.